Siri integration, a 24-hour live radio station, music videos, and tailored recommendations prove Apple isn't messing around when it comes to Music. Apple Music was worth the wait. Amidst a marketing frenzy and controversy over royalty payments and Taylor Swift’s feelings, it was easy to forget that few people had actually used Apple’s new streaming service. Apple finally launched Music on June 30, and it was everything we expected it to be (plus a few surprises thrown in for good measure). Whether you’re giving streaming a try for the first time or just weighing the pros and cons of Apple’s service against rivals like Spotify, Rdio, Tidal, and Pandora, there’s nothing to lose by taking Apple Music for a spin. Let’s get started. Apple Music follows Beats Music’s onboarding process to a T.
Once you upgrade to iOS 8.4, diving right into Apple Music is simple. The revamped Music app appears in your iOS device’s dock. Open it up, and you’re greeted with subscription options. You have to pick between a $9.99 individual subscription and $14.99 family plan, then enter your Apple ID username and password. The subscription will auto-renew when your free 3-month trial ends, but you don’t have to set a calendar reminder to cancel on Sept. 30. You can turn off auto-renew straight from the Music app by tapping on Account > Apple ID > Manage Subscriptions. You’ll still be able to enjoy your free trial even if your flirtation with Apple Music is just temporary. Apple Music mimics Beats Music’s get-to-know-you process by having you tap on genre bubbles to winnow out the stuff you hate and learn what you love. Then it serves up more bubbles with specific artists to really hone in on your preferences. The service uses those indicators, plus your liberal use of the heart button on the songs you want to hear over and over again, to populate the For You section. 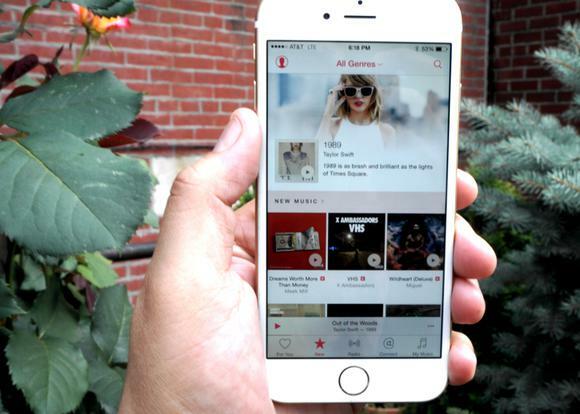 For a detailed walkthrough on setting up Apple Music, check out our guide here. Now let’s explore the five tabs that make up Music’s menu, pinned to the bottom of your screen. I knew it was love when I tapped on For You and Apple Music served up a hip-hop workout mix called “Trappin’ on the Treadmill,” which is perfect for my early morning runs, and a playlist of Beyoncé and Jay-Z collaborations. It was sort of astounding how well the app knew me. I’ve been using Spotify for years and it’s never greeted me with such tailored recommendations—and all it took was tapping on a few bubbles. I expect this section to become more robust as it learns more about my tastes, but the curated playlists and album recommendations For You offers are on par with other streaming services, and reminded me of Beats Music’s editorial point-of-view. Here’s where Music gets a little complicated. New is jam-packed with stuff to listen to, but thankfully the week’s new releases are pinned to the top, which is where they should be. (Taylor Swift’s 2014 release, 1989, currently claims the primary slot even though it’s far from being new, but being the sole service to stream Swift’s opus is Apple Music’s claim to fame, so I’ll allow it.) Apple Music will have the same new albums and singles each Tuesday that the other streaming services have, so this isn’t a differentiator. It’s essential. 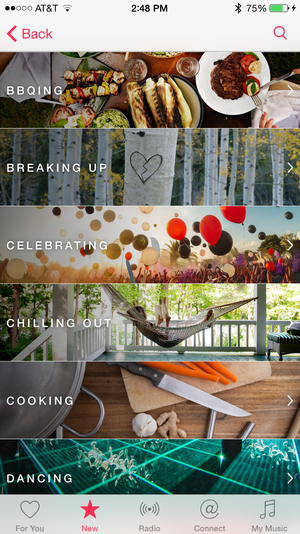 The New section buries activity-based playlists so they’re not easy to find. New also surfaces songs and videos that artists share on Connect, so even if you don’t follow an artist, you can still find out what they’re doing on the Apple Music's social platform. Apple also spotlights selected artists—currently Sia—and highlights songs from new artists, and that’s all after you’re exploring activity-based soundtracks to BBQing, running, and working (these were also snagged from Beats Music and are well worth a listen). The activity playlists should really be featured more prominently, like they are in the new Spotify app’s Moments tab, because having to hunt through Music to find a Friday night soundtrack or a Monday morning productivity playlist isn’t ideal. New has so much music that I could spend hours wading through it, but its UI is a little too cluttered to be useful. I rarely use other streaming services’ radio features, because the best part about paying for streaming is having on-demand access to the songs I want to listen to right now. But Apple is still pushing for radio to succeed, and maybe they’re on to something—243 million people listen to terrestrial radio in the U.S. every week. One of Apple Music’s marquee features is Beats 1, a 24-hour worldwide radio station anchored by radio personalities Zane Lowe, Ebro Darden, and Julie Adenuga. The station kicked off at 9 a.m. Pacific/12 p.m. Eastern with an unlikely first song, “City” by the British band Spring King. They were as shocked as anyone else to hear their song launch the new service. yo @zanelowe are you kidding?!!?!? you just spun our tune! you’re an absolute legend!! “Our genre is ‘great,’” Lowe said, summing up the Beats 1 ethos. 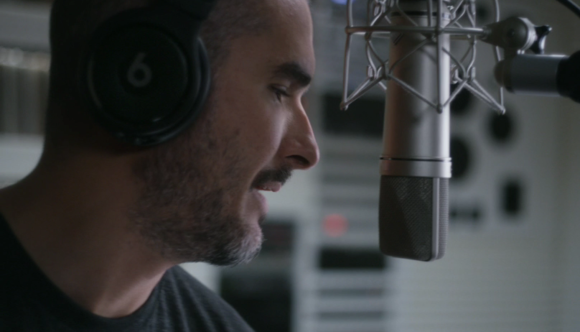 Popular radio personality Zane Lowe kicked off the first hour of Beats 1 with a song from British band Spring King. Each station, even Beats 1, gives you a slew of options to act when you hear a song you love. Just tap on the hamburger menu (denoted by the three dots), and add a song to a playlist or to My Music, share it using the share sheet, or navigate to iTunes to buy it. In Beats 1, these options weren’t available for every song every time, but we’re not sure yet if that’s a glitch or related to Apple’s licensing deals with record labels. Connect could get much better, but right now there’s not a lot going on. I was skeptical about Music’s Connect feature from the moment Apple announced it at WWDC, because there are already so many social platforms I can use to follow my favorite celebrities. Beyoncé posts personal photos and song clips on Instagram. Taylor Swift uses Tumblr to connect with her fans. It’s unclear if Connect can become the place these musicians will turn to, but right now, it’s pretty bare-bones. FKA twigs recorded some choreography she’s practicing for her song “In Time.” Feist shared out a link to an album her friend released this week. Alabama Shakes posted a video of a recording session. The glimpses into your favorite artists’ work are interesting, but not hugely impressive, given that you can see this kind of behind-the-scenes action everywhere. Connect would be much more useful—and more social—if you could connect with friends on the platform to share songs or collaborate on playlists instead of simply following artists. I’m planning to stick with Connect to see if it improves, but if you have no interest in following artists, then banishing Connect from your Music is super simple. Just head on over to your iOS device’s Settings > General > Restrictions and toggle off Apple Music Connect. The tab will disappear from your Music dock, replaced with Playlists (which are decoupled from My Music when you don’t enable Connect). When you fall in love with a song, tapping on the three dots next to the title brings up a list of options: You can add it to a specific playlist, share it with a friend, queue it up to play next, or save it to My Music, which is where your entire library lives. Songs you’ve purchased from iTunes sit alongside playlists you’ve built just to stream. You can organize your library however you’d like—by album, by artist, by song, or by music that’s available to listen to offline. Offline listening is a hugely important offering for any streaming service, given what a data-hog streaming can be, so Apple makes it very easy to move your must-have music offline. You can also remove downloads to save space on your phone while keeping them in your iCloud Music Library (just tap the ellipses next to the song title and tap Remove Download). You can play with the settings to manage music storage on your phone by heading over to Settings > General > Usage > Manage Storage > Music. Siri integration with Apple Music is huge because it offers something no other service can. So Connect isn’t all that great yet, but social networking was never Apple’s strong suit. Where Cupertino consistently kills it? Integration. The way Siri works seamlessly with Music to queue up the songs you want to hear is a perfect example of how Apple products can offer you a frictionless experience—and it could be a game-changer when it comes to streaming music. Never before have I been able to tell my phone to play an album just released today and have the first track thrumming in my earbuds within seconds. It’s actually kind of magical. 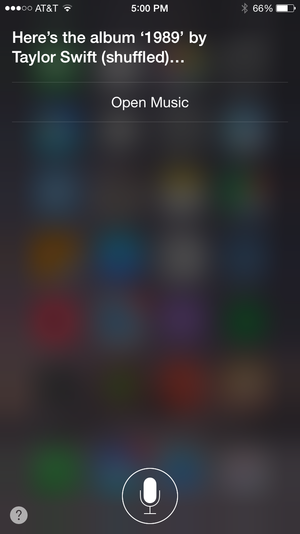 Siri’s capabilities when it comes to Music are incredibly powerful. She can do the basics, like play a specific song, album, or artist. She can also add songs to your queue, shuffle an album or an artist’s entire catalog, find chart-topping hits from years past, and figure out what you mean when you tell her to “play that one song from True Detective.” (She chose the theme, which is what I was looking for.) You don’t even have to have the app open for Siri to do all of this heavy lifting. I don’t often find uses for Siri, but her integration with Music is a huge selling point for me, and just might convince me to give up my Spotify premium subscription. Apple Music is free for three months and comes preinstalled when you upgrade to iOS 8.4, so giving the streaming service a shot is a no-risk, no-effort move. I recommend taking it for a spin if you use a competing service to see what you like and what you don’t. If you prefer owning your music to streaming, Apple Music makes it incredibly easy to discover new songs you might have never listened to before and then buy them straight from iTunes. Between Siri, music videos, Beats 1, and the playlist curation and recommendation tech Apple lifted from Beats Music, Apple Music makes a strong case for streaming and proves the Cupertino company just might revolutionize music all over again.